Troll Purse was started as a means to distribute games under a common title. Today, we will discuss our first distributed game, Eight Hours. Taking on a different model, rather than selling early access games, Troll Purse wants to create games to garner interest in them. If enough interest is found in a game, we continue to develop it at a commercial level. Our first game, Eight Hours is our first attempt at such a model. Eight Hours development started in late 2016. Troll Purse was born a few months afterwards in February of 2017. The reason Eight Hours started was to add real world paranormal elements into a horror game. Also, Eight Hours was to change the models of either using weapons in horror games or running and hiding as a means to survive. These two thoughts created the first iterations of Eight Hours. Originally, there were two games slated for development, or at least designed in documentation. The first was title “Sick Day”, the second “The Hauntings”. “Sick Day” was meant to be a story rich, deeply psychologically driven horror game focused on the impacts of guilt and denial. It was to feature a new way to interact with player’s from the games perspective. Rather than displaying data directly to an in game HUD, a cell phone held by the player character would drive all interactions within the game. This was to be achieved via text messages, voice mails, and smart home controls. Eventually, the plot would change and remove these controls (literally) from the player. Because the phone was a physical in game element, the idea was to use the phone as a natural way to remove control from the player - rather than “randomly” disabling buttons. Unfortunately, creating a story rich game with fear based on psychology is expensive in nature. Voice actors, writers, and strong animators would have been required to create the level of immersion required by the game play and story of “Sick Day”. Thus, the game stopped at the prototype phase. However, all was not lost, as most of the code moved onwards to a new project. “The Hauntings” was designed to be a horror themed strategy game. The idea of the game was to have player’s assume the role of a paranormal investigator looking to launch a career in mainstream ghost hunting. The core of the game was to select locations and equipment for filming ghostly places. Each haunted area would randomly generate haunting events that must be captured by the crew to score higher ratings. The technical work required to create a playable and production ready game with such a small team far out weighed the time frame in which a final product could be developed. From here, the majority of game play events in Eight Hours was born. “Eight Hours” sought to introduce the novel idea of real world Electronic Voice Phenomenon into a horror game. Before, most of the spooky voices and “captured” voices in other horror games were a work of art, not fact. Sourcing from the Paranormal Investigators of Milwaukee, Troll Purse was able to grab raw, unedited EVP captures from real paranormal investigations. So far, four of these EVPs are in the demo. The plan is to collect more and make collecting these EVPs a core part of the game play. So, from those previous prototypes and a desire to bring the real world of the paranormal into a game, Eight Hours was born. Here is a glimpse into what it is all about. Eight Hours plays the same as most games when it comes to controls. It uses standard first person movement controls for PC. This is mouse for looking and W,A,S,D keys for moving and strafing, and the mouse button to interact with objects within the world. What changes within Eight Hours in comparison to other horror themed action or adventure games are the objectives and the way the player survives. A long lasting trend in hobby and indie horror game development is to follow the pattern of Amnesia: The Dark Descent where in, the player is unable to combat the monsters within the game. Rather, the player must run and hide to survive. Another excellent game that follows this is Outlast. These types of horror games really rely on the flight mechanic of fight or flight. So, they have chosen to alienate the other half of world (or some other portion of the world) that would actually choose to fight. What happens here is they weaken player choice within a dynamic medium such as games. Granted, this does create a strong feeling of helplessness as the player literally can’t do anything to help themselves to save themselves. Backed in a corner? Too bad, YOU DEAD! The “run and hide to survive” pattern emerged because a lot of scary games were actually just turning into shooters with horror elements. While good games like F.E.A.R, Resident Evil, and Dead Space existed, the definition from horror game with shooting elements to a shooter with horror elements became more apparent with each new installment. Games like this focus on the fight mechanic of human survival. On top of that, there is the added stress of resource management in regards to ammunition. However, some of these games would either stall if you don’t have any more ammunition, in which, you can no longer progress. Another issue is that again, an entirely different group of people with a different mindset are alienated from the game due to a lack of game play choices. Out of ammo, can’t progress, can’t skirt enemies? Too bad, YOU IN LIMBO! Troll Purse wanted to take a different approach. It wanted to introduce the choice between non-typical weapons and the run and hide mechanics. This was achieved in several ways. Eight Hours does not use weapons in the typical sense. The rules within the reality of the game is that spirits cannot exist within lighted areas. Why? Because the wave and particle behavior of light disrupts the physical manifestation of the spirit. So, the spirit does actually still exist, but cannot interact within the physical realm. 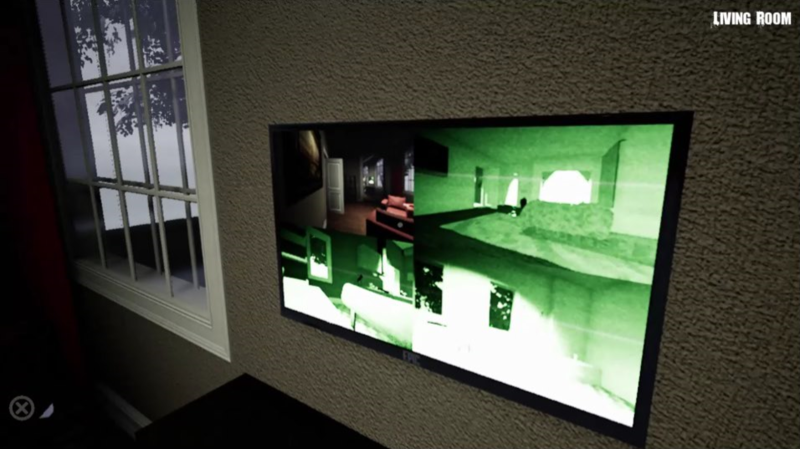 So, within the game, the player is able to activate lights within the haunted abode to attempt banishment of an entity. This mechanic also follows the limited resource style by only installing a fixed number of lights that can only be activated from a fixed location. Finally, it takes several indeterminate seconds for the light to fully banish the entity. To add a layer of strategy to the game, the player is enabled to detect the spirit. There are two forms of detection. Visual and Audio. Alternative light detection devices or enhanced night vision devices will have to ability to capture the movement of a “shadow” “cast” by the entities manifestation within the physical realm. Also, as it is being disrupted by light, the entity will cast a brief shadow. The second form of detection is audio. The player will have access to devices that will detect the electromagnetic force given off my the physical manifestation of a spirit. This will warn the player by playing a sound as the the spirit closes in within the proximity of these devices. To enhance the level of doubt, the player is able to strategically place these devices in a static location. They will not be able to detect the proximity of the spirit in regards to the players position. If fighting is not within the skills or desires of the player, the player will always have the choice to evade the physically manifested spirits within the game. Combined with the different strategies to detect a spirit the play can find rooms to dodge into to avoid the spirit chasing them. Not much more to it than that. It is believed by some that playing with the EVPs of spirits or entertaining the idea of the existence of spirits invites them into your life - within reality. Not sure how to help out there. But, perhaps you should turn on the lights just in case.